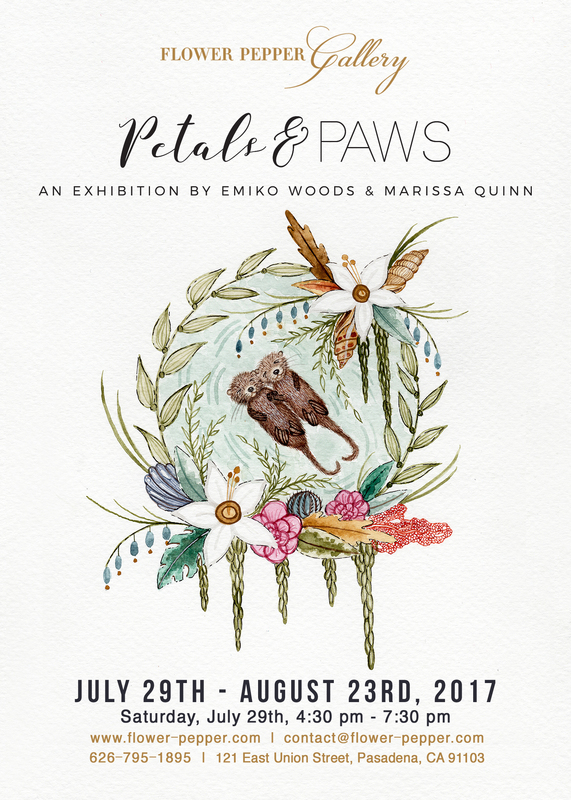 On Saturday, July 29th, Flower Pepper Gallery is pleased to present Petals & Paws, a two-person exhibition by Emiko Woods and Marissa Quinn. This show, as the name suggests, is heavily inspired by nature and its creatures that roam wild and free. This source of inspiration is a deep well that is full of patterns, rhythms, and complexities that enlighten all who care to study them. While both artists share much in common, their work is markedly unique in tone and focus and overall provides the viewer with alluring and meaningful worlds to get lost in. Emiko Woods was born and raised in Los Angeles and after graduating with her BFA, she moved to Switzerland where she is currently based. Her work is greatly inspired by the seasons and what they can teach us about living lives in harmony with those patterns. By incorporating seasonal flora & fauna, she highlights the subtle changes that portray the feelings we associate with different times of the year. Growth, joy, comfort, and peace are all themes she channels though her delicately detailed work. She is also fascinated by spirit animals and how different people are drawn to certain creatures and their attributes. Animals also live very seasonal lives. They migrate, store food, hunt, and change their coats all in accordance with the changes throughout the year. Their instinctual sensitivity to these events display lives lived in absolute harmony. Her work aims to connect with the viewer through these innate spiritual truths and create moments and space for peace and enlightenment along the way. Likewise, Marissa Quinn is a Los Angeles/San Diego based artist whose intricate pen and ink drawings narrate cyclical stories of extinction and growth in nature. Having been raised on the salty shores of the Pacific, Marissa’s work deals heavily with marine cycles and oceanic narratives. Each piece is laden with growth and decay that speak to the soul on a deep metaphysical level. Full of rich detail and layers, it is easy to get lost in the magic she creates on paper while her message pierces directly through the everyday noise to the heart. Her work is genuine and rich with meaning as she herself spends the time and energy to seek and journey into a world of deeper connectivity with nature. For this exhibition, each piece by Marissa deals with specific endangered species along the California coastline, and playing with touches of human interaction within the compositions (such as human hand growing from a wolf's paw), in order to bring awareness to both environmental degradation caused by human hands and conservation effects from the same hands. There is a powerful message wrapped in elegant artistry and balance in Marissa’s drawings. This exhibition touches on some of the most compelling attributes in nature that speak to the spirit and inspire growth and harmonious living. Each artist has her own distinct voice that carries a tune in celebration and in awe of the incredible world around us. A world full of great mysteries and adventures to be revealed within its petals and explored by its paws. Free admission to the Opening. Family friendly. Many thanks to Wall Street International for the feature! Click here to view. Click here to see this exhibition's Artsy page.